There are many pet owners among the Wyoming Valley Kia staff, so we certainly understand when customers tell us they hate to leave their animals home alone when taking a road trip. 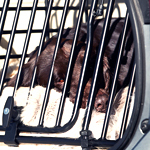 We've found that a little advance planning goes a long way toward making your pets safe as well as comfortable when they are passengers in your vehicle. Get your pet used to your car by taking short trips to the fast-food drive through or just around the neighborhood. Make certain your pets ID tags on their collars are up-to-date with accurate contact information. Make sure their microchip information is current. Have your pets travel in proper carriers or using specially designed seatbelts while in your car. Never seat them on your lap or anywhere on the front seat area. Never transport pets in a pick-up truck bed. Keep windows rolled up and never leave pets unattended inside cars.